Think about how much more a player might enjoy SimCity if there was more strategy in that game than just building a city and keeping it running. What if there was some sort of combat engine, requiring the player to repel hostile attacks? How about an additional module to allow the player to set up trade routes with other simulated cities, thereby affecting the output of the original city's factories? Such is the challenge offered by Caesar II, a much more "complete" experience than that provided by SimCity. Caesar II consists of three distinct modules, creating a game that can be played in one of two ways. For the player who is only interested in building at the City Level, the "City Building Only" option will allow him to found and construct a city worthy of being the gem of the Roman Empire. 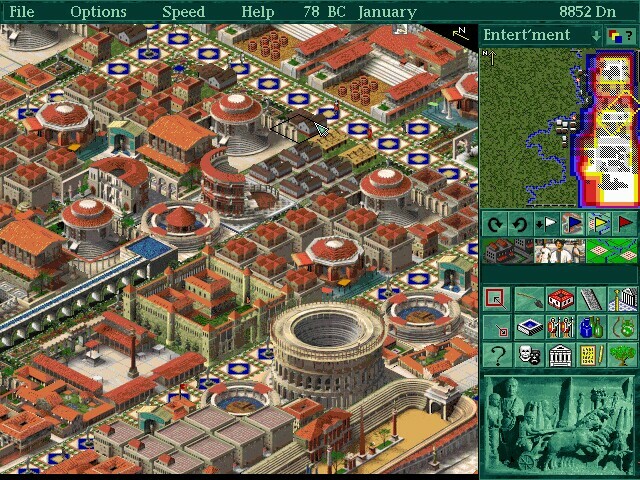 Graphics of ancient Roman structures appear as the player builds housing for his residents, reservoirs and aqueducts to supply water and a system of roads to facilitate travel. Other endeavors include building markets for the selling of goods, industries to supply goods to the markets, security facilities for sim-safety and temples and shrines in which to hold the monetary unit of the game, denarii. If successful in building up his population, the player might consider constructing educational facilities, bathhouses and hospitals for sanitation and entertainment locales like theaters, arenas and circuses. Additional buildings increase property values which in turn cause nearby residences to upgrade themselves, attracting a larger population and earning the province's Governor more denarii. Playing the "Full Game" adds the other two modules to game play. At the Province Level, the player is charged with conquering a number of European provinces one-by-one by setting up trade routes with small villages and building industries such as farms, mines and many other resource-creators. Building a working city at the City Level is also required in the full game mode. 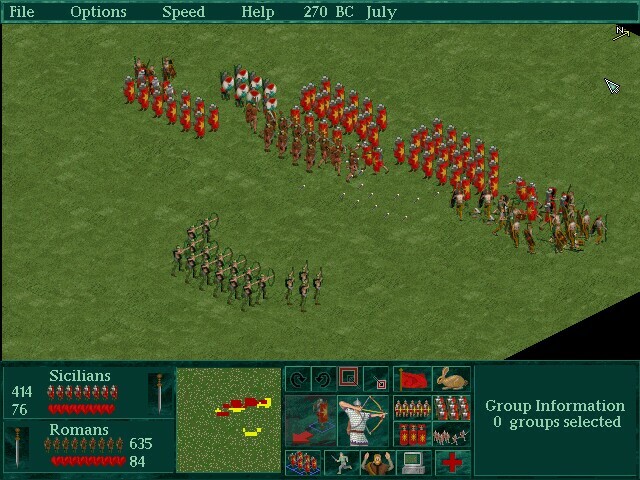 Further, if hostile forces are encountered at Province Level, a combat module automatically kicks in which allows the player to either fight the battle automatically using the statistics of each military force or to actually line up his forces in battle formation and fight the opposing force in real-time. If the player is successful in satisfying the four performance criteria in a particular province, he receives a promotion and is given the opportunity to conquer a new province containing all-new challenges. 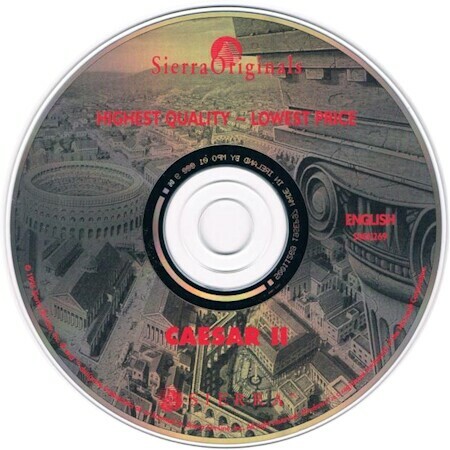 Whether you call it SimCity with real-time combat and trade or Civilization with city-building responsibilities and without a research tree, Caesar II is a fantastic game. Since its release in 1995 I played the game several dozen times. And like Civilization it never gets old. When that happens, when a game's ambience transcends its mechanics and aesthetics, you have a timeless masterpiece.